The writing style in general was pretty good, bordering on poetic at times, making it easy to picture items (the piano), situations and places. Owing to their cultural background, some characters sometimes spoke in Spanish, or what is close to it; I can't say whether this is annoying or not, because my own experience with that language, albeit very rusty, was still solid enough to allow me to understand. “Homeostasis”: a take on cybernetics/neural implants and what it may mean in terms of envisioning “the soul”. When half your brain has been taken over by an eneural to help reconstruct your persona and allow you to function again as a full human being, can you be sure the person inside is still the person, and not an artificial intelligence? “The International Studbook of the Giant Panda”: bizarre, with a dash of humour, a little disturbing, too... but surprisingly enough, past the first “WTF” moment, I realised I was enjoying this story a lot. “The Macrobe Conservation Project”: disturbing too, in different ways. On a space station, a scientist tries to help preserve a fragile ecosystem based on parasites/symbiants living on corpses. Meanwhile, his son's only contact with his on-planet family is through robotic versions of his mother and brother. “American Moat”: when aliens meet the local border patrol... hilarity ensues. And yet, there is something deeply worrying in this story, because it makes you wonder: is humanity really worth it, or are we just stupid bags of meat who'd better be left to rot? 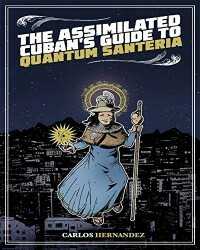 “The Assimilated Cuban's Guide to Quantum Santeria”: the eponymous title and last story of the book. After his mother's death, a little boy desperately wants his father to be happy again instead of lonely, and turns to (dark) magic to help him. Bonus for the magical dead cat. Again, there are funny elements in there... but also reallyl touching ones. The road to hell is paved with good intentions. And with pigeons. The other stories were good as well, and none struck me as abysmal—if I had to rate them, they were all 3 stars minimum for me. 4 stars out of 5. I definitely recommend this book.